Hiya guys! 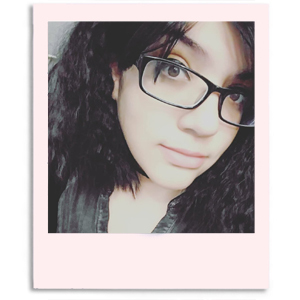 I'm loving the summer weather, it definitely brightens my mood when it's nice out. Of course, I love matching my nails to the sunny brightness outside. Bring on more summer collections I say! Today I'm sharing swatches for the Selfie Summer 2017 Collection by Morgan Taylor Lacquer, which consists of four creams and two shimmers. These were received compliments of Morgan Taylor as part of the #PreenMeVIP program. Let's get to the swatches! 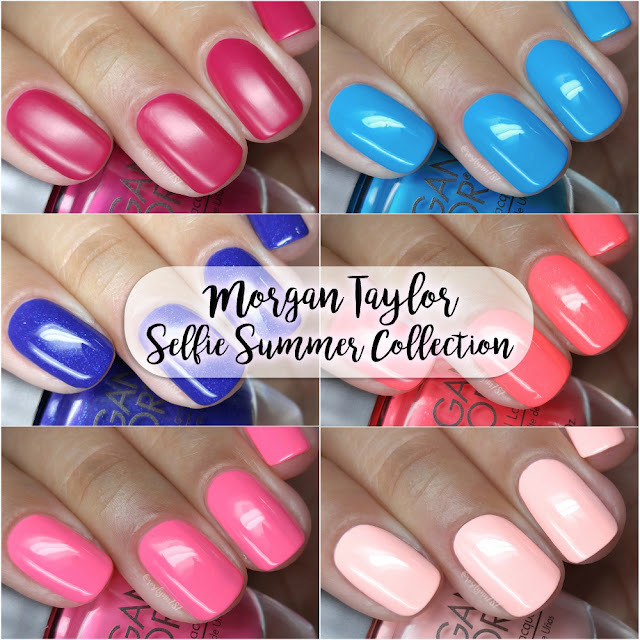 The Selfie Summer 2017 Collection by Morgan Taylor Lacquer is now available for purchase at JCPenny and online. Each shade retails individually for $9, in duo packs for $18, or in a mini pack for $15. Woke Up This Way can be described as a electric fuchsia neon cream. The formula has a sheer application, but has a pretty good build-up. It has a balanced consistency and gave me no issues when layering. This one ended up drying to a satin matte finish, so I decided to not topcoat and show you how it looks. I did experience some minor staining to my nail bed and cuticles on removal. Shown in two coats and no topcoat. Best Face Forward can be described as a purple neon cream with a hint of blue shimmer. Hands down my favorite in this collection, I actually wish the whole collection consisted of shimmers. It has a really nice contrast, especially when hit in direct sunlight. The formula has a really opaque application, but not quite not enough to be a one coater. It has a really nice balanced consistency and smooth layering. I did notice that the bottle does a bit of settling overtime, but it's nothing something that effects the application. Shown in two coats and sealed with a glossy topcoat. Pretty as a Pink-Ture can be described as a pink neon cream. Definitely the closest to a true neon in this collection. It didn't photograph as bright as it actually is in person and totally made my camera spazz out. That said, I didn't love the way it looked against my skin-complexion. It clashes a bit, in my opinion. The formula has good opacity, but it does apply a bit on the streaky side. However it ends up self-leveling well and has a nice consistency as well. It dries down to a satin matte finish on its own. Shown in two coats and sealed with a glossy topcoat. No Filter Needed can be described as a blue neon cream. As one of my favorite colors, it's no surprise this ended up being a favorite from this collection. The formula has a sheer application, but builds-up well for full coverage. It has a thin consistency, but it's not runny and perfectly manageable. I would also like to note that I experienced no staining on removal. Shown in two coats and sealed with a glossy topcoat. My, Myself, and I can be described as a coral neon shimmer cream. I'll admit I am always on the fence when it comes to corals, but this one ultimately won me over. That said, the shimmer is on the subtle side and doesn't stand out as much as I would have liked against the base. The formula has a good opaque and smooth application. It builds-up well and very evenly on the nail. Consistency felt a bit on the thick side, but manageable for layering. It dries to a minimal gritty finish that smooths out perfectly after topcoat. Shown in two coats and sealed with a glossy topcoat. All About The Pout can be described as a light coral cream. I'd like to note, this one didn't photograph as coral as it looks in person. The formula has a surprisingly good amount of opacity for a light color. Application is very smooth and has great self-leveling. Consistency wise it's balanced, not too thick or too thin. Shown in two coats and sealed with a glossy topcoat. Overall while I do love the polishes in this collection I do ultimately end up wishing there were more color varieties. For me, there was just too many in the coral to pink color group. I would have loved to see a bright yellow or orange shimmer added to the mix! That said, I do love the formulas throughout this collection they're very balanced and easy to work with. Must have pick has to go to Best Face Forward, the shimmer is absolutely gorgeous! But that's my favorite, which one is yours?